Hello everyone! Happy first day of the month we thank God for His mercies. Today’s Word is powerful! Wow there is so much in this chapter glory to God, and I pray that you are blessed and encouraged by it. Thank God that now we do not need to inquire of anyone before we can receive the Word of God. For we have Jesus the Living Word whom is shared with all! King Ahab is funny, he hated the prophet because he never prophesied anything good to him, and because he did not prophesy anything good to him he thought he was evil lol! The Word of God is good and not evil. However, even though the Word of God is good it is also what it says in Hebrews 4:12. His Word rebukes in love. His Word is Truth, and sometimes the truth hurts. What a wise response from Micaiah! This must be the exact attitude that we have as Christians. We need to be bold and speak The Word of God no matter how displeasing or how pleasing it may sound! Remember Micaiah prophesied to a king! If Michaiah could speak words of truth to king Ahab, then why can’t we speak words of truth to our friends, to our loved ones, to the people that God has been leading us to speak to?! The worst thing is that they may get angry, or irritated like king Ahab but so what?! They can’t kill you. Did king Ahab kill Michaiah after all those times he had been irritating him with the word of God? No. I have been trying to do this more often at work, encouraging them with prayer and the Word of God and to my surprise they haven’t rejected or looked at me like I’m crazy for the sharing an encouraging Word with them. I’m praying against that spirit of fear, and I pray for the spirit of boldness now! In Jesus Name! The Spirit of The Lord confuses the enemy! When I read verse fifteen I was thinking did Michaiah prophesy falsely to king Ahab because he was afraid? No that was far from the case! The Lord used what king Ahab wanted to believe to destroy him, since he refused to listen to the truth that Michaiah the prophet had previously prophesied to him. King Ahab was deceived and destroyed by what he chose to believe, the lie. Do not be persuaded by self, do not be persuaded by the lie, do not allow yourself to be deceived, else you will allow yourself to be destroyed! Learn from the story of a supposed man of power king Ahab. God said His people will perish for lack of knowledge, for not knowing His Word, for not knowing The Truth. Know The Truth, The Living Word Jesus Christ and accept Him before it is too late! Above Him there is no other. If one refuses to accept the Truth (The Word of God), then they choose to believe the lie of the enemy. The enemy deceives and destroys. The world is irritated by the Truth, they blaspheme against The Truth, they hate The Truth, and it’s sad. The world would rather believe the lie which keeps them in captivity, rather than The Truth which sets them free. They can ridicule you, curse you, arrest you, but they can never ever ever destroy you for proclaiming The Truth, The Word of God! Hallelujah for Jesus our Lord our King has won the victory! And indeed The Word of God came to pass and king Ahab was destroyed! No one can escape the judgment of God. The city of refuge is the place of Truth. The city of refuge sets the captives free. The city of refuge is the place of deliverance. The city of refuge is the place of prosperity. The city of refuge is the place of peace. The city of refuge is the place of justice. 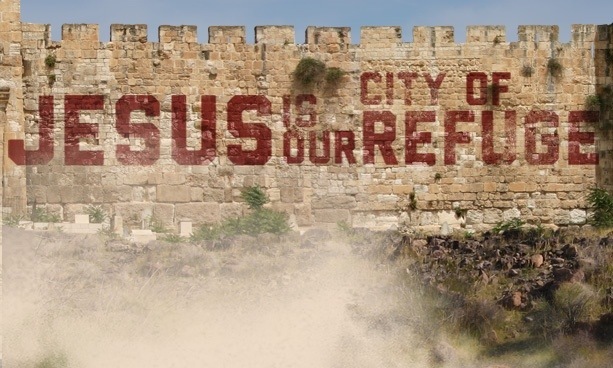 The city of refuge is the place of restoration. The city of refuge is the place of victory. The city of refuge is the place of revelation. The Holy Spirit put this beautiful song into my heart yesterday.